Sunset Overdrive is the Xbox One's great hope. This is the game Microsoft wants to use to sell the world their shiny new toy, and you know what? It works. Like Halo did before it and Perfect Dark Zero was supposed to, Sunset Overdrive is the Xbox One's debut party. It's a really late party, but it's clear Sunset Overdrive was worth the wait. Sunset Overdrive is a game that's almost more about how you get to your destination than what you do there. 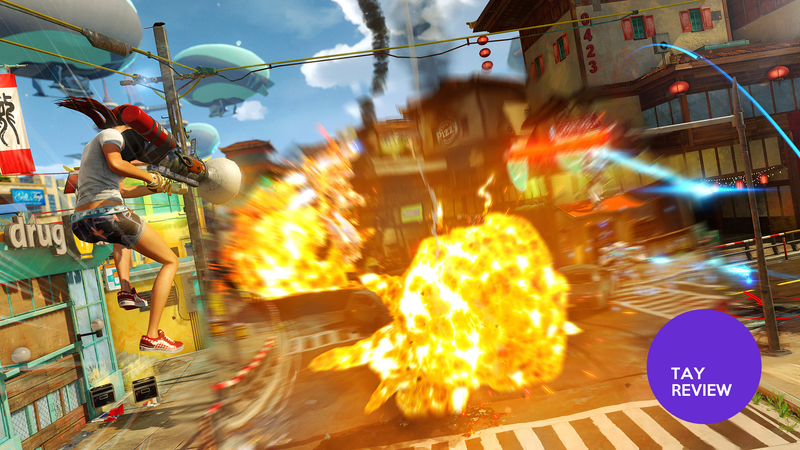 Unlike most shooters, Sunset Overdrive frowns upon running and cover-shooting. If you try to survive on the ground, you'll die. Instead, you'll bounce impossibly high off of the roofs of abandoned vehicles, run along walls, grind on rails or across power lines, air dash between structures and glide across the surface of the water. If you're not spending most of your time in the air, you're doing it wrong. Once you get the hang of how to traverse Sunset City with style, you'll never use the game's fast travel feature again. Staying on the move is as much a critical combat skill as it is a fun way of getting around. In a way, the game feels a bit like Jet Set Radio, one of my favorite games of all time, with guns. That definitely isn't a bad thing. As a result, Sunset Overdrive forces the player to constantly think on their feet, evaluating every surface and for how best to keep their movement—and thus, their combo—going. There was a bit of a learning curve, as the game doesn't do the best job explaining what your various abilities and how best to use them, but that's half the fun. Like so many games seem to be doing these days, Sunset Overdrive allows you to customize your character. You can't really fine tune your character's actual body much, there are two body types per gender and a number of preset faces, but that's pretty much it. Where Sunset Overdrive's character customization really shines however, is in the fact that you can choose to change these features whenever you like. If you're tired of being a lanky punk rocker midway through your campaign you can be a burly bearded lady if that's your thing. The fact that there are no gender-exclusive outfits or features is also one of the game's greatest strengths. Nothing is off limits. More developers would do well to follow Insomniac's example and give players the freedom to be who they want to be. Sunset Overdrive is the most beautiful, visually arresting game on Xbox One. This is the game you'll show off to friends to let them know just what your new console can do. Sunset City's colorful landscape is a character all its own, from exaggerated, cartoony explosions to inexplicably bouncy cars, boats and windows. Character models also look great, animations are exaggerated but fit the setting of the game well. Water looks great and fire effects are particularly impressive. This is a game that makes me excited for the Xbox One's future. I haven't seen guns this wacky since the last big Xbox One exclusive, Dead Rising 3. In fact, just about every weapon in Sunset Overdrive feels like it'd be right at home in Capcom's zombie killing sim. There's something that's just fun about taking out OD with a vinyl record gun. Or launching flaming bowling balls at them. Or dropping a group of scabs with a weaponized teddy bear. Weapons not only feel original, but each have advantages against certain types of enemies, which is a great way to encourage the player to try out multiple different guns. Not every gun feels great, and you'll find your own personal preference, but they each have their own charm to them. Each gun can level up as well which will improve their damage and give you the ability to equip amps. Amps are a pretty big deal, because they can drastically change the value of a gun. There are amps that can create mini nuclear explosions, freeze enemies, set them on fire or even turn them against one another. Overall Sunset Overdrive does an excellent job of getting you to switch between various guns and try them out. No single gun carries enough ammo to get you through an entire mission, and ammo doesn't drop frequently enough to let you continuously return to the same gun. Even if enough ammo was available, it's fun to switch between guns, as most are a joy to use. 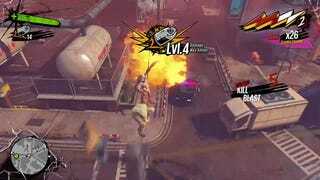 Sunset Overdrive's multiplayer, dubbed Chaos Squad is essentially an eight player version of the single player campaign's night defense on steroids. All eight players will cooperate to take out waves of enemies. Each player gets their own score to add a small layer of competition to the mode. Even better is the fact that you get to take your character, amps and all, into multiplayer and can earn loot to take back into the single player campaign with you. With eight times the regular Chaos of Sunset Overdrive's already insane action, the Chaos Squad monicker is nothing if not apt. If you love the concept of Sunset Overdrive, you'll love Chaos Squad, plain and simple. There aren't a lot of boss battles in Sunset Overdrive, but the few Insomniac did create are perfect examples of what a boss fight should be. Bosses are epic and huge, on a completely different scale than any of the game's other challenges. Bosses also challenge you, making you use multiple tricks in your arsenal while staying on the move. They aren't particularly difficult, but they do keep you on your toes. You can't just let your guard down and expect to win, and the settings are just fun. Chasing a madman down a roller coaster track or fighting a massive Fizzie balloon above the city feel unique, like a breath of fresh air in an already refreshing game. Yannick didn't care much for Sunset Overdrive's particular brand of humor. I can't say I agree with him. Sunset Overdrive is hilarious. Sure, it beats you over the head with the "Hey, check it out, you're playing a video game!" jokes, but most of them made me at least crack a smile. For seasoned gamers, it's hard not to laugh at the jabs Insomniac's writers took at some of gaming's oldest and strangest conventions. I can't count the number of times I heard something funny and yelled at my Kinect to record it so I could share it with friends later on. Few games are capable of being this funny without resorting to South Park (which is still the funniest game ever) style humor. The main character, girl or boy, is voiced really well and delivers funny lines regularly and the humor seldom feels forced. If this were a game that was dark and gritty, like say, Gears of War, the humor wouldn't work, but everything about Sunset Overdrive lends itself to this, it just works. Sunset Overdrive boasts a predictably wacky set of survivors of the fizzocalypse. It starts out innocently enough, with a group of prep school survivors called The Oxfords. They're about as normal as things get, from there you'll meet LARPers who refuse to break character, even when faced with their own death and a Japan-obsessed Boy Scout troop. Of all the characters introduced, perhaps Sam, the first you meet is the most important to the story. He's a socially inept genius who can seem to hack just about anything for your use. Though it never results in actual items, Sam is an integral player. The rest of the characters (with the exception of Floyd, whose voice actor turned in a really scattershot performance) are voiced well and are funny at time, but ultimately aren't very memorable. The LARPers provide on of Sunset Overdrive's funniest moments, but feel overly stereotypical. The idea of factions is introduced fairly early on, but never amounts to much. Factions really amounts to a black and white Good Guys vs. Bad Guys scenarios, which is a bit disappointing, because it felt like the underpinnings of something much greater. Night Defense works really great in multiplayer. It's a fun mode when you amp up the number of traps and enemies and add a few friends. In single player it's a little less interesting. Waves feel a bit too short, in fact every time I hit my stride and started to keep my vats protected efficiently, all the OD would be vaporized and the next wave would begin. Conversely, when the waves would begin, it always felt like my barriers would get overrun too quickly. It seems too easy to just put as many traps as you can as close to the vats as you can and wait. You'll win every time. It's a fun enough mode, and doesn't take away from the game, but it'd be nice to just have it work a bit tighter with one player instead of eight. Kirk said it. I'll say it. You'll probably say it, too. Sunset Overdrive's soundtrack is just terrible. It's grating to the ears and actively makes the game worse. The best thing you can do to maximize your enjoyment is to mute the music. I understand Sunset Overdrive has something of a punk rock aesthetic to it, but the music sounds like what you would get if someone commissioned punk rock tracks for use in hotel elevators. Playing with the music on just adds a cacophony of annoying noise to an already chaotic battleground, taking away from the tight combat. Whenever the music would ramp up I wouldn't get excited, I'd just grit my teeth and kick myself for not having remembered to kill it. Sunset Overdrive is the game the Xbox One has been waiting for. This is the first game that has the potential to lure people to Microsoft's side of the playground. It's dripping with style and is an absolute blast from start to finish. Sunset Overdrive is crazy, absurd and above all else, fun. If you have an Xbox One, this is an essential game for your library. If you don't, it might be time to consider picking one up.